The entire perimeter of the farm is fenced. 4 feet up with an electric wire at the top, 2 feet out on the ground. Helps to prevent climbers and diggers that we do not want in with our livestock. The electric went dead the other night. Investigations are challenging: eagle eyes must cover every inch until the break(s) are located. This time it was a piece of plastic that broke, causing wire connections to come unstrung. 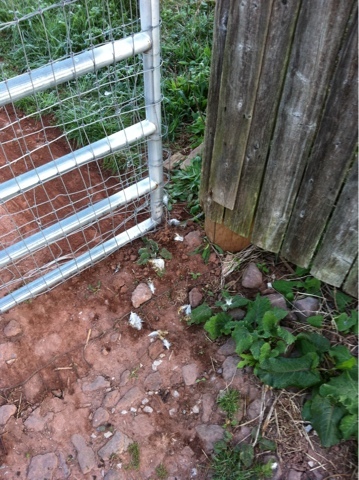 At the same time a gap at the gate has developed. 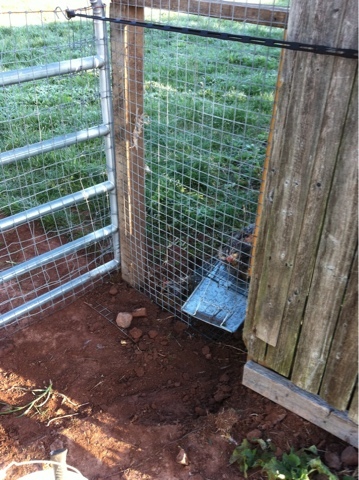 Close examination showed a trail of feathers through the gate..none of our birds took this route voluntarily. It was one of the predators we do not want inside. Reinforcements installed, trap baited and set. Gaps sealed, electric current running again. Hoping for no loses this morning.